We are making history in the Her Money Matters podcast with having the first ever male on the show! Johari Hemphill is a dedicated officer in the USAF who has been serving for 16 years. He has a competitive personality, is a pronounced history/current events buff + life philosopher. He is my partner in life and the one whom I am proud to call my husband. Don’t forget to join us over in our community! What resonated with you most about this episode? Please be sure to share with us in the comments below! [00:00:08.0] ANNOUNCER: Welcome to the Her Money Matters Podcast, the podcast to help you take control of your finances. Join your host, motivational money coach, Jen Hemphill, as she shares with you practical, simple money insights into real life stories by women like you. Let’s get to it. [00:00:25.8] JH: Welcome, welcome. This is Jen Hemphill, your host. I appreciate you tuning into yet another episode of the Her Money Matters podcast. I want to quickly remind you before we get into this episode that there is a vibrant community of amazing women waiting to connect with you. You can join over at Jenhemphill.com/community. It is a private Facebook group, we have a lot of fun in there and we’re going to be celebrating the one year birthday of this podcast next week. Plus for those of you in the Northern Virginia, DC, Maryland area, we are actually having our first meet up and you can find those details in the group. So it’s definitely a good thing to go over there and join the group. Now, as for today, I have a very special episode especially for me as I am introducing to you a very special man in my life, my husband. As a matter of fact, not only did I do this episode because of this month’s theme of money and relationships but my husband and I are also going to be celebrating 16 years of marriage the day after this episode airs. So if you are tuning in the day that it airs on the 16th of June, the next day is our anniversary. So it’s exciting to be celebrating 16 years and it’s crazy to think that that much time has passed by. In today’s episode you will learn what my husband’s work to spend self-philosophy was early on and how this changed. You will also going to learn a challenge we encountered early on in our marriage and what he learned from it and you’ll also going to learn who influenced him the most in the area of money and why. So let me share with you a little bit about my husband Johari Hemphill. He is a logistics officer in the US Air Force who has been serving for 16 years. He’s super competitive if you just watch him play soccer, any sport for that matter or if you’re in a FitBit competition, he is definitely a man-man. He is a history buff, he knows all about history and current events. He loves all that stuff. He is a great mentor about life. He will definitely school you in a hot second. Well okay, he’s a talker so maybe it will be a little longer than that and he is definitely a good compliment for me and an awesome father for our boys. Now without further ado, let me introduce you to finally the mystery man that I’ve been mentioning over the past several weeks, my husband Johari Hemphill. 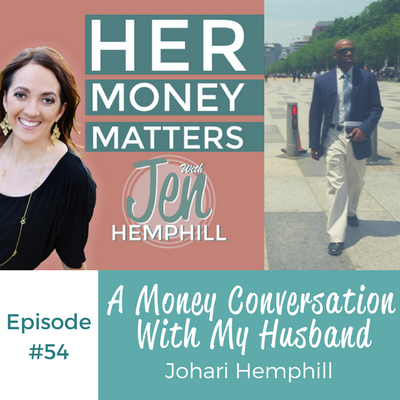 [00:03:28.9] JH1: Welcome to my husband, Johari Hemphill to the Her Money Matters Podcast. I’m excited and actually a little bit nervous about this interview. I’m happy to have you here though. [00:03:37.8] JH2: All right, glad to be here. [00:03:39.7] JH1: So are you ready to dive into these questions? [00:03:43.4] JH2: I guess I’ll have to be ready. You got me here sitting ready to talk to all your podcast friends. [00:03:49.4] JH1: Oh my goodness. So tell me a little bit about how you grew up around money. So share with us a little bit about your money story. [00:03:57.5] JH2: Well my money story is one where my parents taught us about money even created a savings accounts for us however it wasn’t anything that we discussed on a day to day basis or something that we sat down as a family and say, “Hey, let me tell you about money.” All I knew is that my parents worked, they made enough money to take care of my brother and I and we didn’t seem to want for anything. However, I learned later in life that was not always the case. [00:04:23.3] JH1: Okay, so let’s fast forward when you met me. Tell me a little bit about how your outlook of money was then. So you grew up around money a certain way but you went to college, of course you became very independent, you’ve been working jobs since you were I think 16 years old or 15? So tell us a little bit about that. [00:04:44.3] JH2: Well of course as a kid you get different jobs whether you’re cutting grass or you’re raking leaves or you’re finding some way to make money for yourself so you didn’t have to ask your parents. Well in my case, I did those things but I was very good at spending my parent’s money and saving my own. So when I wanted to buy certain things, I did have that opportunity. However, as you talked about me going to college I was on a partial soccer scholarship but a lot of the money came through loans and I found out later on in life as you know when we got married how much those student loans bothered me later on. [00:05:22.5] JH1: And when we got married, well when we met, we definitely had a little bit of different outlook or on how we viewed money and how do you think, if anything, that affected our marriage, whether positive or maybe given us, if it gave us some tension? [00:05:40.0] JH2: Well money was probably a contentious issue especially coming into a relationship and even a marriage with student loans and the other half it doesn’t. So you kind of feel like you’re putting a burden or at least I felt like I was putting a burden on our family, me and you, in the beginning by having student loans that would take us years to pay off. Of course now a lot sooner than we thought based on your experience with money and your frugalness versus mine. [00:06:26.4] JH1: I always, when I talk and somehow in podcast interviews, you always come up and I’ve always mentioned how you’ve balanced me where I have always been the saver and kind of a hoarder of money to an extent where I didn’t want to spend that money and you balance me in that way. So what do you think through we’ve always been married 16 years actually this week when the episode is released. So how do you think from the beginning on our marriage to now, what have been our challenges in regards to money? [00:06:58.1] JH2: I would say probably one big challenge for us with money is being that we’re in the Air Force and we have a steady income, a lot more steadier than as I mentioned, my parents. I just found out this week talking to my mom that she made only $7,600 a year as a secretary but you would never know it by the things that she provided for my brother and I. So as I fast forward to now and able to give back, one of those challenges is if somebody called, I would say, “Hey, let’s support them,” and not really looking at what our financial situation was into any great extent. So knowing where we are now and being able to go, “Hey maybe we shouldn’t help this time,” but that was probably a challenge in the beginning because it would be help, help, help but then we would probably be in a worst situation than the people we were trying to help. [00:07:53.1] JH1: Yes, I remember those days. That is something that I think also challenged me to be more of a giver honestly because I came from and because I always was saving and became this “money hoarder” because I always afraid to not have. I think you challenged me to be more of a giver and now fast forward 16 years later, we are in a position and we have talked about and we have always sent money aside. So in those cases where a family member needs help, we’re able to do that without throwing things off with our budget. Now, what do you feel is the best money that we’ve spent? [00:08:34.1] JH2: The best money we spent has probably been on our children’s education. That was one thing being on the military and able to transfer my 911 GI Bill over to them but before that even became an opportunity or you did some research and figured out that 529 college fund worked and that was after we have already been saving money when the oldest wasn’t even born yet. So the investment for their future is always to me the best money spent because if we can allow them to be better than we are earlier in their life then that’s worth the true investment. [00:09:15.1] JH1: And how about the worst purchase, what do you think has been the worst purchase we’ve made? [00:09:19.7] JH2: Probably the worst purchase and it’s probably my fault was that we bought a house at one of our assignments after renting and I decided that, hey I didn’t like what the landlord was trying to force us what to do and not allow us to do. So hey we need to buy a house. You’re a real estate agent, found us a house and you did. And little did you know we would move probably a year later fortunately to a place that allows us to save some money but it ended up for us paying a mortgage two mortgages for about a year which strained our financial situation on top of student loans. [00:09:55.3] JH1: The good thing is that we got through that for sure but yes, I remember that time. In actuality, we’ve bought two homes and the first one I think when we were younger it was early on in our marriage and it was that mentality that we always heard, “Well, you don’t want to be renting. You want to be investing in a house,” so we did that. But whether it was a good decision or not, who knows? But we made the best of it, we made the decision and we just moved forward but yes, that was another time where we were paying rent and mortgage at the same time because we weren’t able to sell for a while, so that definitely made for an interesting time in our lives. How about the best money advice that you’ve received. Tell us about that? [00:10:47.0] JH2: Best money advice I received, and it’s probably from various people to include yourself is, “Hey, we’ve got to invest in ourselves first.” You pay yourself first because if you don’t have anything for the long term, it’s not going to matter in the short term because you will never know what emergency situation is going to arise whether it’s our immediate family or whether it’s our parents or whether our grandparents or even a kid. These cars we have to drive around and do end up stretching the budget sometimes because it never happens when you want it to happen. [00:11:19.5] JH1: And what do you feel you do well with money? I know we’ve talked about me being the saver, you being typically a spender but we always do something well with money. What do you think that is for you? [00:11:37.7] JH1: You crack me up. Well I think one thing you do well is actually you do better with me is when you go shopping, you go to the clearance rack and I sometimes forget about that part. So that is one thing, you do tend to look for the deals. So I gave you one there but yeah, you’re funny. How about who has influenced you the most in the area of money? [00:12:00.6] JH2: Influenced me the most with money, probably I would say my mother based on what I just found out about what we really lived on, how you get caught in credit card debt trying to take care of your family and I know many of you that will listen to this podcast can understand that but you do what you have to do to take care of your family and make a better way for them. But my mother was the one who took me, my brother and I, to the bank to open up a savings account, to understand how to write in a ledger, to, “Hey, make sure you’re saving, make your money work for you,” and so throughout college when there was those times where you’re doing work study or working another job on the side after soccer practice, you at least knew that you had money to take care of yourself. So my mother influenced me a lot and I thank her for showing me how to get it done in life and it helps me throughout the day in my Air Force career. [00:12:59.1] JH1: Well I have to vouch for your mom just because I lucked out. Not everybody has those great stories of the mother in laws but I definitely lucked out with a really good mother in law. So I cannot complain about that. [00:13:14.1] JH2: The other thing that influenced me was the Prosperity Game that you had me do while I was away last year but we did together. It was one of those things where we could say, “Hey, if we had X amount of money for a day each day, what will we do with it?” And it really made you think what were the things that matter to you the most, which of course you could pay yourself. So I think the Prosperity Game that you had us do was a great tool to really sit back and look at and somethings we’ve actually been able to implement by paying ourselves and even giving to charity at times where we didn’t even — probably didn’t even think we could. [00:14:13.8] JH1: Yeah, so basically the Prosperity Game is by — if you Google Abraham Hicks and I think what really opened my eyes, I think for me besides being able to just think about the different things that we can spend the money on, I think it was, it eased. Even though I don’t think we ever had issues in talking about money necessarily. Sometimes the asset can be tense but I think it eased a money conversation between us. Not only that, I think I definitely learned things about you through that as well. So I will definitely put a link in the show notes more about that Prosperity Game if you all are interested. Definitely a great tool to learn about your partner, about yourself, to ease the money conversations because in a marriage sometimes that can be hard to do, to talk about money. So as you know that this podcast is about making money simple, taking control of it, how would you finish this sentence, Her Money Matters because ____. I know his money matters also but when we’re talking about women, why would you say her money matters because ____? How would you answer that? [00:15:31.7] JH2: Her Money Matters because whether you’re in a relationship or not, your money and what makes you happy is important. So if you understand where you’re sitting at, where you’re finances are at, where you are in life and you know what at the end of the day makes you happy, it’s probably going to have some — money is going to have some influence. So make sure that when you’re making a decision, not all decisions have to be made on money but make sure that you understand your situation where you’re trying to go and help yourself before you try to help someone else. [00:16:10.2] JH1: I like that answer. Well that is it. I appreciate you being here with me even though I’m with you most of the time, but this has been great. A little nerve racking for me honestly but I think it’s great for others to hear from you and get a little bit of inside scoop more on behind the scenes of my life as well. So I appreciate you being here and answering the questions even though some of them were uncomfortable for you. [00:16:39.6] JH2: Thank you for having me. [00:16:43.0] JH: So what did you think? Big hearted and funny, right? And actually we didn’t get him in the mode of being super funny because he gets in these modes of just being crazy funny and then also, just a little sneak scoop, he also gets in these modes of being super serious too. So it’s like super funny, super serious, you’ll never know what you’ll get with him. He is just unpredictable. So I hope that you have enjoyed the interview with him but I wanted to make sure that I go into further a little bit about the Prosperity Game that he mentioned because I know it definitely made a huge difference for us but before I do that, I do want to give a quick shout out to Gina in Virginia. She’s part of our Her Money Matters community over on Facebook. She not only shares her life experiences, but she has provided some super tips. So I wanted to thank you Gina for being a part of the group and for you contributions as we definitely appreciate them. So let’s talk a little bit more about this prosperity game. So if you Google Abraham Hicks and Prosperity Game, you will find it. Basically, I just took — I can’t say I followed it to the tee but basically the premise of the game is you take 30 days and you schedule out 30 days to do this and you “spend money”. So it’s not real money that you’re spending but you start out on day one with a certain amount that you decide you’re going to spend. So you start day one with a certain amount. Whatever amount you deem whether $100, $50, $1, it doesn’t matter and each day what we did was we decided like 50-50, like you spend 50% and I’ll spend the other 50 and we decided what we’re going to use that money on. So we did this when he was deployed, he said about a year ago and actually this was about, oh my gosh, almost about five years ago now. Anyways, so we would e-mail this back and forth. So every day, we were diligent about what we spent and the kicker is that as the days go on — so the first day you start out with let’s say $100, the second day you add on to that amount. So it could be $101, you could kick it up to $200 but the ideas for every day you’re going to be spending more money. Again, this is imaginary money and you’re going to decide on what you’re going to spend on whether it could be debt, whether it can be on a home, whether it can be whatever. The sky’s the limit as to what you want to spend on. So that is basically how you do that for 30 days and really, you think that when you have an unlimited amount of money to spend that it would be easy to do. Well, it gets you to think, really, really gets you to think so I will let you work that out but so we used it for 30 days and I guarantee you that if you have trouble speaking with your spouse about money, this is an easier conversation because it’s a game. It’s not the real life but so it’s an easy way to ease that money conversation and not only that, you’re going to learn about your partner. You’re going to learn about your spouse. You’re also going to learn potentially how they grew up with money because whatever they spend, that’s going to give you some clues here and there. So that is it, how it works. I wanted to make sure that I spoke a little further on that and by all means, you don’t have to be married to do this. You can do this if you’re single. I mean I encourage everyone to do this just because it’s really, really helpful and it’ll give you more of an insight on you as well. It’s gets you more thinking on how to spend money not only that but it gets you dreaming again because sometimes we forget to do that just because we get so bogged down on life itself that we forget about the fun things that we could be dreaming on. And when we start dreaming again, that’s what’s going to propel you, that’s what’s going to motivate you to move forward. So I wanted to make sure that I share that with you and that is a wrap for today. I want to thank my husband, Johari, for joining us and really being a trooper because basically, I told them he was going to do this. I didn’t ask him. I just said, “You’re going to be on the show.” So I appreciate him just being a trooper and just going along with me and you can check out the show notes over at Jenhemphill.com/54. Don’t miss next week’s episode as we will be celebrating the one year birthday of the Her Money Matters Podcast. So there is a very special episode for that and I also would love for you to join us in celebrating over in our community. So that’s over at Jenhemphill.com/community. So thanks again so much for tuning in today and we’ll catch you next Thursday. I stumbled upon this site dong some research for my teaching. Knowing both you and Johari personally, I think it is great that you are sharing your expertise to help others be as successful as you are. This was a great interview which had some fantastic insights based on real-life experiences and the prosperity game looks like a great way to initiate communication about finances for couples who may have problems talking about money. Thank you for giving back and giving others the tools that can make their lives better, and best wishes to you and Johari for continued success. Thanks so much Brian! I apologize the delay in my response. Hope you are doing well.